I often tell Agile coaches to start with a health check on the teams they are about to coach. People think this a health check is a great idea and they often research complex algorithms and assessment tools. But that is really hard work for you and the team. So at our coaching clinic we tried a lazier alternative – I put these conversation starter kits up on the wall. Pairs of coaches came up to the wall, selected a set of questions and picked a victim and an inquisitor. There inquisitor then asked the victims three questions on the page. After 5 minutes the pair swapped roles. At the end of the exercise we chatted as a group and highlighted the key things we had discussed. 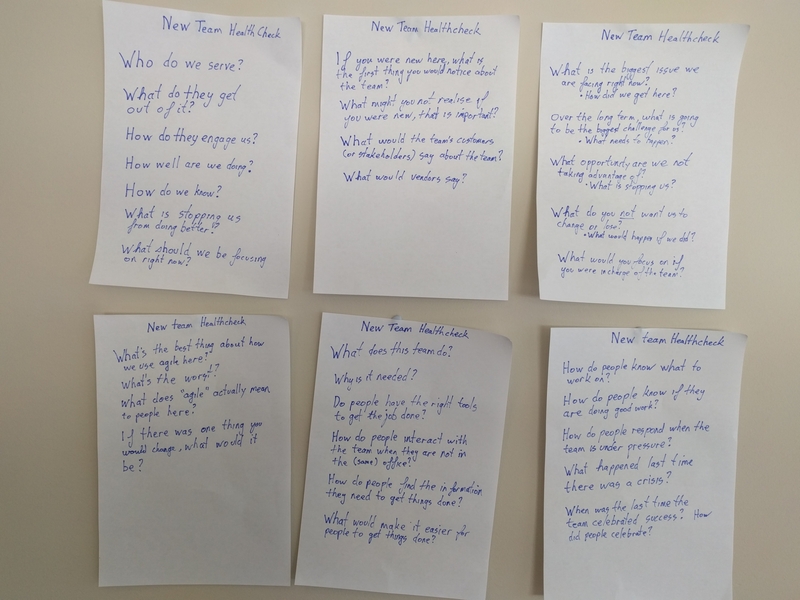 It turned out that there were quite a few repeating patterns and we were able to share some tips on how teams can use this information to make simple improvements to their lives. I then said that this is what I do … But not as a workshop. I go and ask individuals one at a time in a safe environment to collate a view across the team(and the manager and some others). My favourite set of questions are from a book called `The First 90 Days`by Michael D Watkins. But then one of the crew asked why I don’t just run this as a workshop with the team the same way we just did with the coaches. Perhaps, he wondered if I am a control freak or if there is a legitimate reason speak to people one on one. Actually my reason is a lack of imagination. In hindsight this send like a very Agile easy to do the assessment. Just get the team to do it with a choice of conversations like these. So next time maybe I will get small groups to explore one set of questions. Then swap people around to review a different set and then share. Who knows, they might not even need me to run it if they do this during their retro. PreviousDo you get value from your retrospective?